Some corporations want to create a two-tier Internet that would allow them to slow or even block content that is not in their corporate interests. 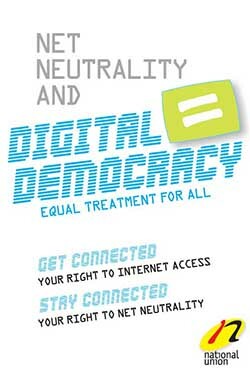 This issue is called Network Neutrality the "principle that all Internet traffic be treated equally, regardless of origin, destination, or application type." This is not an issue solely about corporate profit or the growing power of telecommunications companies - it is also about the rights of citizens to exercise control over one of the greatest innovations in communications history. Should these companies succeed, it will undermine the Internet's level playing field and will make it much more difficult for the small and independent voice to be heard on the web.